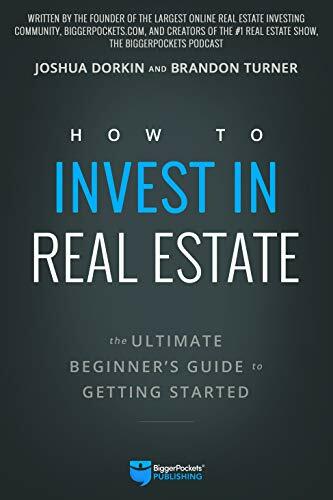 A good intro to breaking into real estate investing from the team behind the most popular podcast on the subject. Some of it is skimmable, but it’s a more concise intro resource than sifting through podcast episodes. Therefore, a lot of investors end up going through the hassle and expense of setting up an LLC only to find themselves not able to use it on their purchase. You might not know if you are at the top of a cycle or the bottom, but you can know if you are in a buyer’s or a seller’s market, and your strategy may shift depending on that knowledge. Your Mentor: Every successful entrepreneur needs a good mentor, a guide. By training under the watchful eye of someone smarter than we are, we can only get smarter. Your Partner: You don’t need a partner to invest, but if you have one, he or she will be a valuable member of your team. Realtor: An exceptional real estate agent is fundamental in your investing career. You or your spouse may even choose to become a real estate agent so that you can gain access to the incredible tools that agents have. Property Manager: If you don’t want to actively manage your properties, a good property manager is important to have. Mortgage Broker/Loan Officer: A mortgage broker is the person responsible for getting you loans—especially if you are going “conventional” (not hard or private money). Real Estate Attorney: It is important to have someone on the team who can go through contracts and who knows the legalities of all your moves. Accountant: As you acquire properties, doing your own taxes and bookkeeping becomes increasingly difficult. As soon as possible, hire an accountant (preferably a certified public accountant, CPA). Insurance Agent: Insurance is a must, and as an investor, you will probably be dealing with a lot of insurance policies. Contractor: A good contractor seems like the hardest team member to find, but can often make or break your profit margin. Great Handyman: Someone to take care of the little things that come up on a daily basis is imperative to have on your team. One of the best sources for finding these team members is through referrals from other investors. Many, many real estate investors purchase residential properties with conventional loans, transfer the property into an entity, and simply live with the potential risk. you invest in rental properties and hold on to them for many years, you are obviously not self-employed. It’s an investment. There aren’t a lot of reasons to put your properties into an S corp, but rather a lot of reasons why you shouldn’t. However, if you buy and sell real estate while holding the properties for less than one year, the government considers you self-employed, and now an S corp could save you a lot of money. To illustrate this point, let’s use an example. Raw land is, well, dirt. Perhaps the most common investment for most first-time investors is the single-family home (also known as a single-family residence or SFR). Single-family homes are relatively easy to rent, easy to sell, and easy to finance. Because so many people want to live in single-family houses, these types of investments can often sell or rent much faster than other property types. For example, when I (Brandon) list a home for rent, it typically rents faster and for more money than my multifamily properties. A single-family home can be fairly simple to manage because there is just one tenant living inside. Generally speaking, we’ve also found that single-family houses tend to attract a higher caliber tenant who takes better care of the house. A single-family home is just one property that will require its own financing, its own rehab, its own management. And one single-family house is unlikely to make anyone rich or provide true financial freedom. Therefore, if you buy single-family houses, it may take a large number of them to reach your financial goals. That’s why many investors who start with single-family houses end up jumping into other, more scalable niches, as it can take about the same amount of work to buy a 50-unit apartment building as it does to buy a single-family house. Another downside is competition. Because everyone wants to own or live in a single-family house, when you shop for homes you are competing not only with other investors but homeowners who are willing to overpay for properties because they are emotionally attached to the deal. Small multifamily properties are any residential property that has between two and four units. Yes, that means a duplex, triplex, or fourplex (also known as a “quad”). These property types are slightly harder to find than single-family houses, but exist in almost every residential area of the world. because fewer homeowners are looking to buy a small multifamily property to live in, there is often less competition than you’d run across bidding on single-family homes. While small multifamily buildings are made up of between two and four units, large multifamily properties have five units or more. This could mean a simple $200,000 fiveplex or a $200,000,000 500-unit, A-class behemoth. Although larger multifamily properties can also be considered “commercial,” what we’re really talking about here is nonresidential commercial investments. These commercial investments can vary dramatically in size, style, and purpose, but ultimately involve a property that is leased to a business. Mobile home parks, also known as trailer home parks, were popular to build in the middle of the last century, but fewer are being created today. However, a large segment of the U.S. population still chooses to live in this property type, as it is often the most affordable housing they can obtain. with an ideal mobile home park, the tenants own their own homes and simply rent the land. This encourages the tenant to stay longer while decreasing the repairs required on the homes. For those who have a bit of cash lying around, investing in private notes can be a great way to get your money working for you without needing to get your hands dirty. Rather than investing in a piece of real estate, you are investing in a piece of paper. Essentially, you are creating an IOU—officially known as a “promissory note”—to someone else, and each month that person (usually an investor, but sometimes a homeowner) pays you instead of a bank. So basically, with note investing you are the bank! REIT stands for real estate investment trust. In the most simplistic definition, a REIT is to a real estate property what a mutual fund is to a stock. Crowdfunding has emerged as a solution for those investors, while also giving normal everyday people a method for directly investing in deals and, ideally, the ability to achieve higher-than-normal returns. Buy-and-hold investing, when you buy the right deal, can incorporate all four of the strategies into one powerful investment. The largest downside with this plan, however, is that it takes time. To learn more about the buy-and-hold strategy, be sure to pick up a copy of The Book on Rental Property Investing by Brandon Turner. For example, we know that most properties that fall short of 1 percent will likely never produce positive cash flow. If it’s between 1 and 2 percent, they probably will. And if it is above 2 percent, we’re almost positive they will. The 50 percent rule states that, on average and over time, half of the income a property generates is spent on operating expenses. Imagine a property rents for $2,000 per month. The 50 percent rule says that half of this, $1,000, will be spent on expenses. This means we’re left with $1,000. But then we need to make a mortgage payment on the property (unless you paid cash for it). With the $1,000 remaining, let’s say the mortgage payment is $600. How much do you have left? $400. And while inherent weaknesses do exist, the 50 percent rule does have value. When you are looking at a property that rents for $1,200 per month and you know the mortgage payment would be around $1,000, you can almost guarantee that the property won’t produce a positive cash flow, because $200 is not a lot of “room” for all those expenses. Cash flow: For a single-family house, I try to achieve $200 per month in cash flow; for a multifamily property, I aim for $100 per month, per unit (so a fourplex should make at least $400 per month in cash flow). Cash on cash return: Over the past 100 years, the stock market has averaged a return of 6 to 7 percent. I decided to almost double that and aim for around a 12 percent cash on cash return. Equity: I don’t like owning real estate that has no equity. If the market dips, I want to be sure I’m not going to be “underwater,” where I’ll owe more than the property is worth. Therefore, I aim for a minimum of 20 percent in equity in any deal I do. If the property is worth $100,000, I don’t want to owe any more than $80,000. This can be done in one of two ways: I could find a really good deal that I can purchase (and rehab) for 80 percent of the value. I could put up a down payment of 20 percent, giving me the required equity. Total return on investment: Finally, I try to average around 15 percent per year, or more, over the life of a real estate deal. House flipping is the practice of buying a piece of real estate at a discounted price, improving it in some way, and then selling it for a financial gain. I’m a local house flipper and I’m looking for a deal, so I agree to pay $200,000 for that property. A few weeks later, I buy the property for $200,000, the seller gets his $190,000, and you get a cool $10,000. Not bad for a few weeks of work. Wholesaling is the process of finding great real estate deals, writing a contract to acquire the deal, and then selling the contract to another buyer. When an individual buys a piece of property and builds something on that property, it’s known as “development,” and it’s one of the more profitable, albeit risky, strategies for wealth creation through real estate. House hacking is the strategy of purchasing a small multifamily property—usually a duplex, triplex, or fourplex—using one unit to live in and renting out the other units. By purchasing a great multifamily deal, the rent that your tenants pay each month can cover all of the expenses for the property—and maybe more. When you plan to live in a property for at least one year, financing becomes much more friendly for the borrower. For example, an FHA loan allows for just a 3.5 percent down payment, and the USDA (United States Department of Agriculture) loan allows for $0 down if you are buying in a rural area. If you want to get an even deeper look at house hacking, I’d recommend picking up a copy of Set for Life, written by Scott Trench. Short-term rentals are usually privately owned properties where the owner leases out a furnished home or condo (or yurt, boat, tent … seriously) by the night, much like a hotel. That means buying a fixer-upper home and either fixing it up right before moving in (and then moving in after rehab) or, more likely, buying a fixer-upper and living in the home while remodeling it. BRRRR is an acronym for a popular investment strategy that involves buying fixer-upper rental properties, repairing them, leasing them out to great tenants, refinancing to get your money back, and then repeating the process over again and again. BRRRR investing is very similar to house flipping; in fact, it is house flipping, but rather than selling the house, you are going to rent it out after fixing it up. The same principles that go into house flipping are needed here. And it’s important to rehab with the goal of getting the highest property value and the highest rent possible. For example, if you can turn a two-bedroom home into a three-bedroom home, do it. This can potentially add hundreds of dollars per month in cash flow and tens of thousands in equity. After the property has been rehabbed, it’s time to rent it out to great tenants. Because you just bought real estate in a great location and rehabbed it to look incredible, finding incredible tenants to rent it should not be tough. the fourth step in the BRRRR strategy is to refinance (meaning: pay off the first loan with a brand-new loan) into a nice conventional mortgage after the property has been fixed up. There are a few significant ones to be aware of before venturing into your next BRRRR deal. Most importantly, if you are unable to refinance the property to get your money back out, you are in a tough situation, with your first loan coming due and no way to pay it back. Although the words student rental might conjure images in your brain of frat houses, beer-guzzling teens, and trashed properties, student rentals can actually be a unique way to generate profits through real estate investing. After all, even students need a place to live during college, and with the right systems in place, an investor can ensure above-market rents, possibly guaranteed by the parents. Therefore, in the beginning of your investing, find one strategy and one niche, and pursue it until you have it mastered. A Home Run Deal is simply any deal that is good enough to fit into your financial freedom strategy—and every property out there, no matter what, has a number that makes it a Home Run Deal. Your funnel begins with your options, or leads. A lead is any property that could someday become a deal for you. every property has a Home Run Number, a value that will make it worth buying. Your job is to discover that number, and the only way to do this is through an analysis of the lead. You need to determine if it’s worth pursuing, and you need to get the dead leads out of your funnel. we call this step pursue and not offer, because not every deal needs a formal offer. Sometimes a conversation with a seller will give you the answer you need. Don’t worry about mastering each and every technique we’re about to show you. Instead, find something that works, become an expert on that tactic, and stick with it. you can try searching one of the third-party property portfolios, like Realtor.com, Zillow.com, Trulia.com, or Redfin.com. These websites have negotiated with the various MLS lists around the country to give you access to listings. The problem with using these sites is twofold: Their information might be dated. Their information is incomplete. The second option you have for searching the MLS is through a real estate agent directly. This means the agent will send you information you need to know about the properties that are for sale. Your agent should be able to set you up with an automated email that will send you properties when they meet your qualifications. You should definitely do this, because when it comes to getting deals on the MLS, speed is key. Driving for dollars isn’t just about driving. It’s about driving with a purpose. Your purpose? Looking for potential deals. Find deals Find address or phone numbers for the owners Contact owners Find out if they want to sell Make an offer. Walking for dollars is almost identical to driving for dollars, except for one thing. Yep, you are walking. Most landlords hate the process—so much so that they might be willing to sell. Therefore, if you want to find an amazing deal, why not call up local landlords while they are in the middle of an eviction? With millions of people using Craigslist every single day, why not post a simple ad that says you are looking to buy a house? Contacting landlords who post “For Rent” ads. Not every landlord wants to sell, but would you imagine some of them would? Maybe 20 percent? Maybe 10 percent? Maybe 5 percent? Who cares! The point is, these landlords are giving you their phone number. It will take a few minutes to set this up, but then you’ll be able to just wait for ads with those keywords to pop up. Rather than listing with an agent, they searched the web for “house buyers in Grays Harbor” and ended up on my website. the return given from an all cash deal will not be the same as a deal that’s leveraged. John has $100,000 to invest. He can choose to use that $100,000 to buy a house that will produce $1,000 per month in income, or $12,000 per year. This equates to a 12 percent return on investment. John could instead use that $100,000 as a 20 percent down payment on five similar homes, each listed at $100,000. With an $80,000 mortgage on each, the cash flow would be approximately $300 each month per house, which is $1,500 per month each, or $18,000 per year. This equates to an 18 percent return on investment—50 percent better than buying just one home. But adding loans adds risk, so deciding how much you should leverage comes down to your personal feelings on risk. Most traditional conventional mortgages require a minimum of 20 percent down, but may extend higher—up to 25–30 percent—for investment properties, depending on the lender. Because the money is their own, they are able to provide more flexible loan terms and qualifying standards. Oftentimes a portfolio lender will have funds available with less-restrictive qualifications than a conventional lender. FHA loans are designed only for homeowners who are going to live in the property, so you cannot use an FHA-backed loan to buy a pure investment property. But you can take advantage of the exception to the rule that allows the FHA-financed home to have up to four separate units. The benefit of the FHA loan is the low down-payment requirement: currently just 3.5 percent. While the lower down payments the FHA offers are great, the FHA does require an additional payment, called private mortgage insurance. PMI protects the lender and is required when the down payment on an FHA loan is less than 20 percent. A subset of the FHA loan program, the 203K lets a homeowner borrow money for the house purchase and home improvement with one loan. In some cases, the owner of the property you want to buy can actually fund the property, and you will simply make your monthly payment to them rather than a bank. Use hard money with caution, making sure you have multiple exit strategies in place before taking out this type of loan. Typically, with private money, the lender is not a professional like a hard-money lender, but rather an individual looking to achieve higher returns on their cash. Often there is a close relationship between a private money lender and an investor. Private money usually has fewer fees and points, and the term length can be negotiated more easily to serve the best interests of both parties. John’s current home is worth $100,000. John visits with his local bank and learns that they will allow up to 90 percent debt on that home. John, therefore, can borrow a total of $90,000 on the house. If he already owes $50,000 on a first mortgage, the home equity line or loan would be capped at $40,000 to ensure the total loans didn’t exceed 90 percent. even if you don’t have enough equity in your primary residence to fund 100 percent of the new deal you want to purchase, you could utilize your HELOC or HEIL to fund the down payment on the new property and obtain a regular loan for the rest. The 1031 Exchange: the government gives you just 45 days to find (identify) a replacement property to buy. Therefore, the first step in minimizing dead space is to identify what your Most Important Next Step (MINS) is on your journey. What is the smallest action you can do next to move your goal forward just a bit?